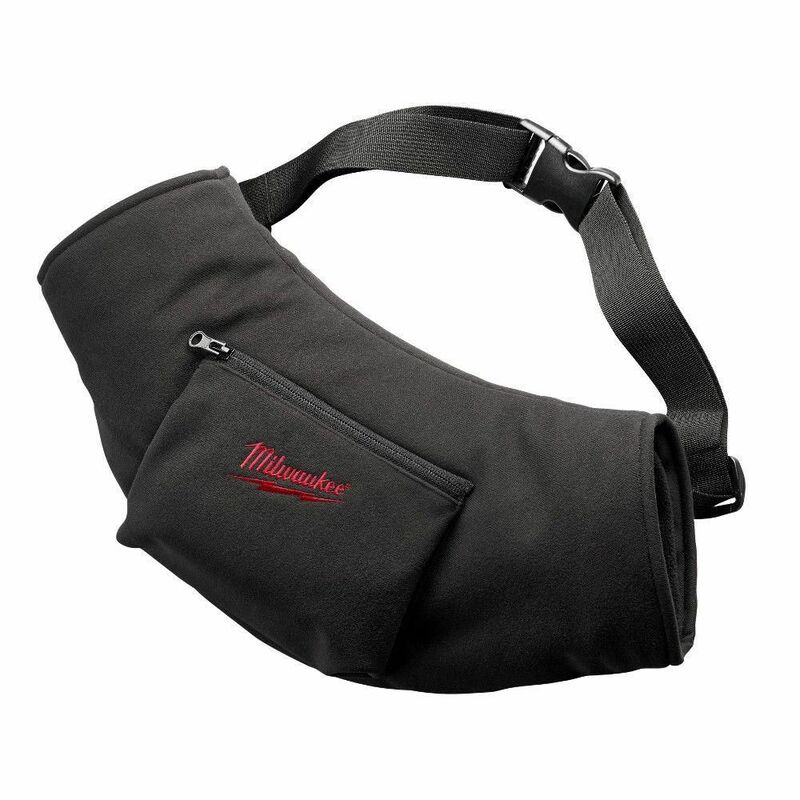 Milwaukee<sup></sup> M12 Heated Hand Warmer: The Milwaukee M12 Cordless Black Heated Hand Warmer integrates carbon fibre heating elements between a durable wind and water resistant exterior and thermal fleece liner to heat your hands and help maintain dexterity, even on the coldest days. Featuring dual-cuff construction that forms a wind-proof seal in combination with your outer layer, the hand warmer provides up to 6 hours of continuous heat per battery charge reducing the need for bulky gloves on or off the jobsite. Adjustable heat zones provide the right amount of heat for any situation. Utilizing the same M12 REDLITHIUM Battery technology that powers 60+ tools, the M12 Battery holder is stored in a sleek back pocket that can expand to fit M12 XC Batteries for extended run-time. All M12 Heated Hand Warmers are washer and dryer safe. One size fits most. The black cuffed beanie hats features a heavier yarn weight to block wind and provide an extra layer of warmth in cold weather. This MILWAUKEE beanie is made from a durable 98% polyester/2% spandex mix that resists snagging. The cuffed knit beanie manages moisture to help prevent sweating and overheating. This warm winter hat is intended for cold weather use on the jobsite or during outdoor activities. M12 Cordless Black Heated Hander Warmer Only Milwaukee<sup></sup> M12 Heated Hand Warmer: The Milwaukee M12 Cordless Black Heated Hand Warmer integrates carbon fibre heating elements between a durable wind and water resistant exterior and thermal fleece liner to heat your hands and help maintain dexterity, even on the coldest days. Featuring dual-cuff construction that forms a wind-proof seal in combination with your outer layer, the hand warmer provides up to 6 hours of continuous heat per battery charge reducing the need for bulky gloves on or off the jobsite. Adjustable heat zones provide the right amount of heat for any situation. Utilizing the same M12 REDLITHIUM Battery technology that powers 60+ tools, the M12 Battery holder is stored in a sleek back pocket that can expand to fit M12 XC Batteries for extended run-time. All M12 Heated Hand Warmers are washer and dryer safe. One size fits most. M12 Cordless Black Heated Hander Warmer Only is rated 3.5 out of 5 by 22. Rated 1 out of 5 by Melissa from Never worked. Charged the battery all night and went to... Never worked. Charged the battery all night and went to use it and nothing! Rated 2 out of 5 by Michael from great idea, puerile design, the liner catches on rough fingers,... great idea, puerile design, the liner catches on rough fingers, the heating coil flops around to bad positions, the belt has to be knotted to fit a 32" waist. Rated 5 out of 5 by wdr from works great for what I wanted, pick up a spare... works great for what I wanted, pick up a spare battery.